Sara is an Apple /// Emulator for the Macintosh. In fact, Sara is the only Apple /// emulator available for the Macintosh, or any computer platform! The current version of Sara is 0.5.0, released on May 4, 2008. Note: Sara is still under development. These versions are extremely preliminary. They don't completely work yet. But they should give you a good idea of what I'm working on. And I'm looking for suggestions as to how to implement the user interface. So now's a good time to take a look at what I have so far. If you would, please take a look at some of my other programs, most are shareware, and all are for the Macintosh. Sara Version 0.5.1 for Mac OS X (Universal Binary) can be downloaded. Be sure to rename the ROM file back to ROM after unstuffing it. Take a look at ftp://ftp.apple.asimov.net/pub/apple_II/unsorted/ for more disk images. Need a way to transfer Apple ][ disks to the Macintosh as a disk image? take a look at my little Apple ][ Disk Reader program. All you need is an Apple ][ with a serial card (or an Apple /// in ][ emulation mode) and a cable to connect to your Macintosh with a serial port. 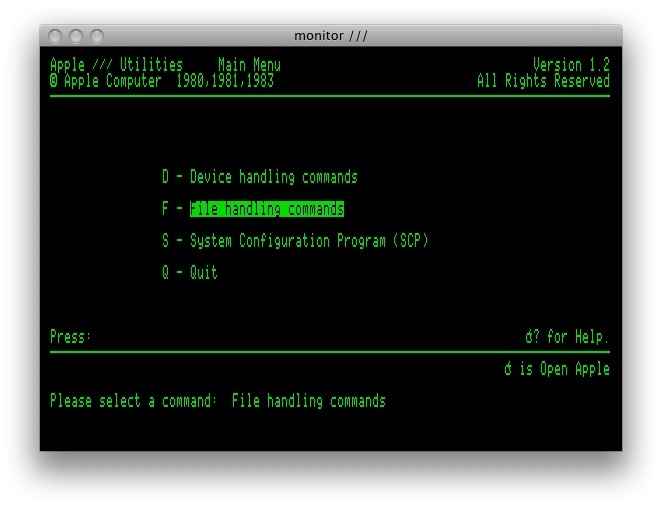 Included is a short AppleSoft program to type into the Apple ][, and the corresponding program on the Macintosh side. It reads an entire disk, and sends it over the serial link to the Macintosh, which stores it as a Dos Ordered disk image file, ready for use with most emulators (including Sara). Apple ][ Disk Reader can be downloaded. If you're interested in emulators for the Macintosh, then you'll certainly want to check out www.emulation.net, as they have links to all of 'em!